BURLINGAME, Calif. -- A passenger train has struck an unoccupied vehicle on the tracks at Broadway Avenue in Burlingame, prompting major delays, according to Caltrain officials. 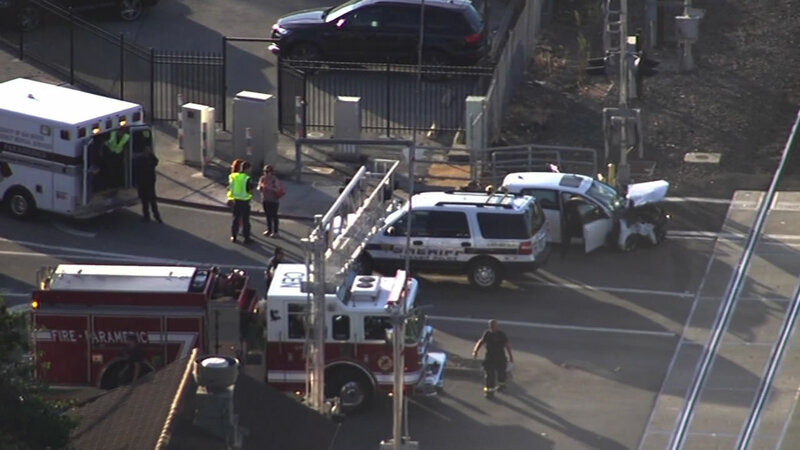 Caltrain reported the collision on Twitter shortly after 5:30 p.m. The tracks have been cleared of debris and northbound trains are starting to single track at speeds of 10 mph. The train involved in the collision, #371, was carrying 900 passengers and 48 bikes, officials said. Commuters in the Burlingame area are advised to take the SamTrans ECR line, which serves El Camino Real from Daly City to Palo Alto. SamTrans will be providing a bus bridge as a result of the delays and BART will be providing mutual aid for passengers. Caltrain No. 269 will provide Northbound service to Burlingame and then turn soutbound for local service. Caltrain No. 370 is dropping passengers off at Millbrae and turning northbound for local service. If you are on 371, please do not leave the train. There are active trains moving in the area. We are trying to move the train. People on the tracks are also causing a problem. Caltrain officials are telling passengers not to leave the hot train cars as there are active trains in the area.